What does success in life look like? If you are a mother or father, how are you modeling success in front of your child? It’s only natural to crave success. After all, no one sets out in life to be just “average.” But success can mean different things to different people. Success depends entirely on one’s goals. If you’re a mom or a dad, I’d wager that “success” means that your son or daughter comes home with a solid report card, or gets a lot of cheers on the soccer field. Success means they grow up to marry a good, moral Christian spouse and raise kids who likewise are upstanding little achievers who don’t drink or lie or swear. All of this, of course, is achievable without Jesus. “Success,” when measured this way, is little more than external performance at best and a form of self-righteous idolatry at worst. “Now this is the commandment—the statutes and the rules—that the Lord your God commanded me to teach you, that you may do them in the land to which you are going over, to possess it, 2 that you may fear the Lord your God, you and your son and your son’s son, by keeping all his statutes and his commandments, which I command you, all the days of your life, and that your days may be long. Success, in the Christian sense, isn’t about achieving a list of goals—as worthy as that may be. Success is about being faithful to the character of God. Now, that doesn’t mean we raise a generation of monks and ministers. But it does mean that we raise a generation of men and women who see their career as part of God’s larger story. There was a puritan proverb long ago that said: “God loveth adverbs.” The meaning, of course, is that God is as concerned with what we do as he is how we do it. How do we raise soccer players who show God’s love to their teammates and coaches? How do we raise boys and girls who honor the boundaries set by God (and their parents) when it comes to dating? How do we raise young adults who choose a career path that doesn’t merely maximize their potential, but becomes an avenue for living out the gospel in their workplace? I realize this is a larger conversation, but for the purpose of this summer we would like to challenge you to get involved in our Vacation Bible School program here at Tri-State Fellowship. You can click here to find the details through our Facebook page. Our prayer is that we impact the hearts and lives of the children who participate, as well as their parents and those in the community who might be entering our walls for the very first time. And even if you’re unable to participate directly, we ask that you pray diligently for the success of this event. After all, our children will grow up to believe in something. We pray that God’s story would be the one that takes root. So where are we dependent as Christians, where are we interdependent, and when are we independent? It probably seems like as pastors that we talk about all three of these ideas at various times, and that would be true. Our theme for the second of the six weeks of the Momentum series has been to address a second myth that we have surfaced: Praying and reading the Bible are habits for nuns and spiritual mystics. When we think of spiritual mystics and professionally religious types of people, there is a tendency to think that those people are the ones who are particularly given over to what we might also call “the spiritual disciplines.” And to some extent, yes, those who work professionally with the Scriptures have a highest standard of expectation in this regard. But there is no doubt from all biblical teaching that God wants to have an open flow of dialogue with us: from Him through the Word of God, and from us back to Him in prayer. It is in this sense that I am speaking to you of being an independent free agent before God. We are dependent upon God and His Word and the work of the Spirit living through us, and we are interdependent upon each other as we serve one another with the gifts that God has distributed throughout the body of Christ. But we are independent to manage our own spiritual development through knowing God in His Word and communicating with Him through prayer. The Scriptures throughout picture this discipline of Bible reading and prayer as a daily sort of thing, as necessary as anything else that sustains your life. It is a daily “as you go about life” routine more than a “when you get together with other Christians” event. So many people today only read the Bible or pray at those times they are around other believers, and that is not the vision at all that God has for us. A great picture of God’s vision is seen in the passage in Deuteronomy 6 – a passage that I’ve often described as the John 3 passage of the Old Testament. In the same way that we see John 3 as embodying the central message of Christ’s mission with John 3:16 as the core, the Jewish people saw this chapter as the central definition of who they were as God’s people, with 6:4 as the central verse. Verse 4 defines God uniquely (and truthfully) as compared to the polytheism of all the nations around them – who had rejected the true God years before. Israel had the one true God – there was no pantheon of competing Gods to have to worship and appease. No, this one true God had given his commands to them, and if they would love him, know and follow his commands, life would go well for them. And we see the daily element in this. It was not just something that happened when they hung out with Aaron and the Levites at the Tabernacle place of meeting. No, it was an everyday thing that permeated life. It was to be a regular daily conversation that happened, particularly in the family system, from the time of rising to the time of going to bed. If we hear from God through His Word, if we commune back with Him through prayer, and if this is to be a pervasive part of our lives, then we need to make plans to prioritize it in our lives. The bad news: this takes some work and discipline. The good news: It is not that complicated or difficult to do, and IT WORKS! 6:1 – These are the commands, decrees and laws the Lord your God directed me to teach you to observe in the land that you are crossing the Jordan to possess, 2 so that you, your children and their children after them may fear the Lord your God as long as you live by keeping all his decrees and commands that I give you, and so that you may enjoy long life. 3 Hear, Israel, and be careful to obey so that it may go well with you and that you may increase greatly in a land flowing with milk and honey, just as the Lord, the God of your ancestors, promised you. But if there was ever a group who legitimately needed to be told “you didn’t build that” it was the Israelites … if there was ever a group who might get a false notion of personal excellence … if there was ever a group who might forget that their abundance came not from their own strength and construction, it was the Israelites. They were going to inherit a land with houses and wells and vineyards all in place. Yes, they would fight the battles, but they could not have prevailed apart from the Lord removing the defenses of their enemies from them. 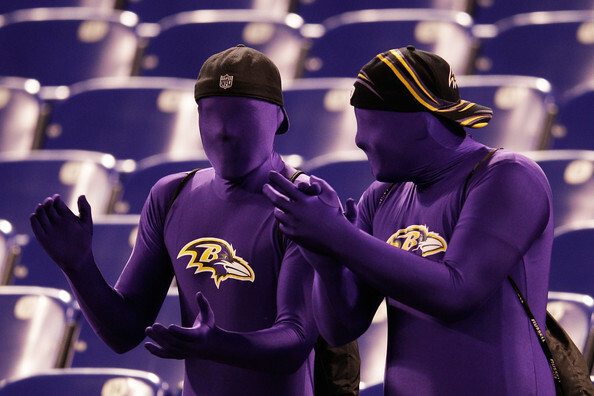 The fans of the Baltimore Ravens are crazy! Now honestly, I don’t mean that in a bad way … quite the opposite really. They are true “fans.” Think about that word “fan” and what it means and from where it comes. It is a shortened version of the word “fanatic,” which describes someone who is sold out in support of a team or cause. During the 2011 football season, one of my sons had suffered a very serious chainsaw accident and was in the University of Maryland Hospital in Baltimore. The second of his reconstructive surgeries took place on the Sunday morning of a Ravens home football game. We were close enough to the stadium that you could likely open the windows and hear the cheering! But what was interesting to me was how every TV set in every room was tuned in to the game. The doctors and nurses were making their rounds, but they appeared honestly more focused on watching the game themselves (as they moved room to room) than providing focused medical care. That is passion, fandom, and support! We need to be that way for God. I’m not saying we need to wear #7 purple and black jerseys with “Yahweh” across the shoulders (although, truth be told, those jerseys would need to be blue and silver). But we need to have that defining internal passion that goes with us all the time – 24 / 7 / 365 … you know what I mean. The human tendency is to make God and His commandments a compartmental component of life… something we drag out on Sundays and perhaps for an observance here and there. What is needed is constant definition. It needs to be THE value that defines every moment of life, informing whatever we are doing. Beyond that, it becomes the daily intentional responsibility to pass this value along to rising generations. Though it is certainly appropriate to have specific times and classes where this most prominently occurs, the greatest success is for it to be absorbed from everything about the everyday moments of life. The old phrase applies here: more is honestly caught than taught. Teaching is great, but truth is really caught by children when they see it truly modeled in the lives of those older generation people who they respect. It is not enough for our faith to be about us and our interests; it has to also be about the generations behind us. God said it, Moses said it, Randy said it … Boom! Do it. Revive!